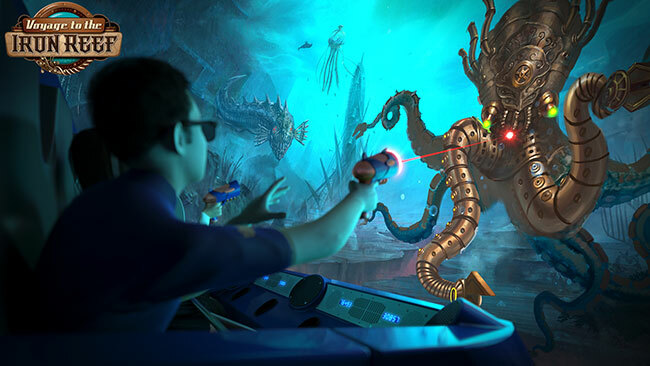 Triotech and Cedar Fair partnered to introduce Voyage to the Iron Reef, a new dark ride experience coming to Knotts Berry Farm in Buena Park, CA. Going into the long vacant Kingdom of the Dinosaur/Knotts Bear-Y Tales building in the Boardwalk section, the building is currently being gutted and will be turned into a 4-D shooting dark ride. 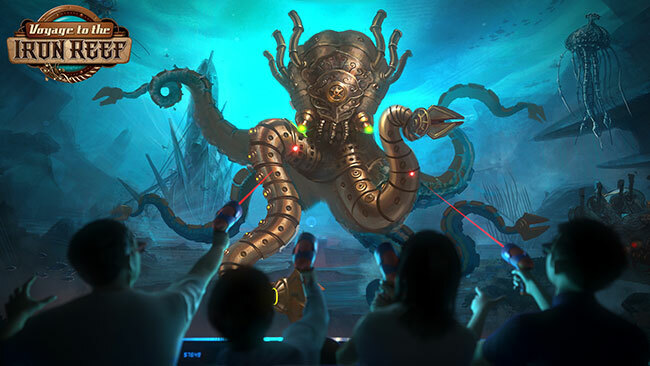 The elaborate storyline that Triotech came up with involves a giant kraken that is currently destroying all the Boardwalk rides. The Kraken need the steel to produce more offspring to take over the world and it is our job to prevent that. 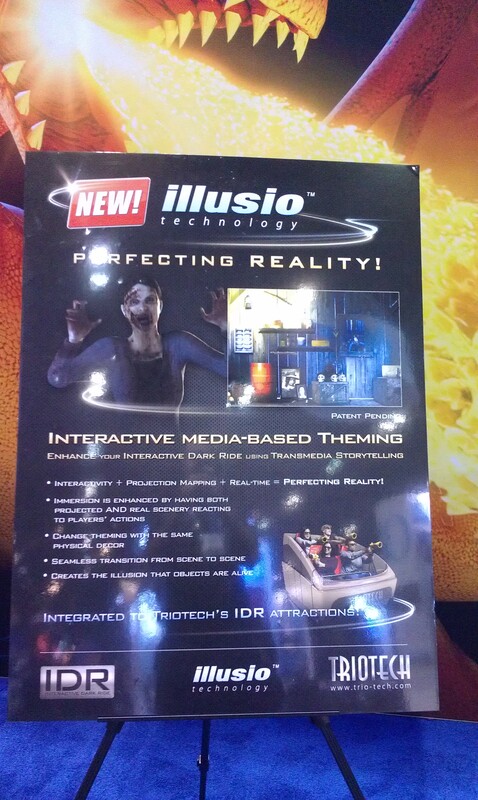 The Triotech stand also featured a large lounge area, a shooting 3-D dark ride and two simulator theaters. After breaking off from Great Coasters International last summer, 3 ex employees got a fourth partner and founded Skyline Attractions in Celebration, FL. 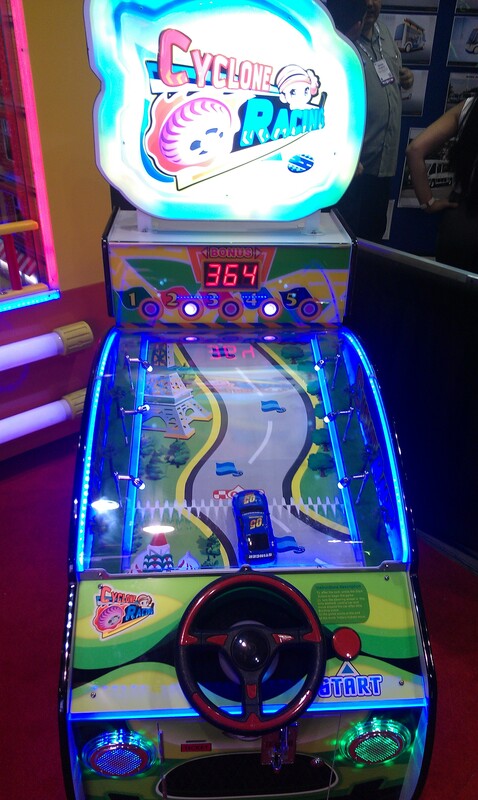 Two new innovative products made their debut at IAAPA: Strike-U-Up and Spin-U-Win. A major departure from the multi-million dollars roller coasters they used to build and design, the name here is innovation and fun! The Spin-U-Win has two kids each sitting on a disk and they each grab a pole and spin around. Whoever fills up the column with lights win. Strike-U-Up combines a ride with the usual show your strength hammer game. When the light comes on, you need to hit the target as hard as you can and when you do, your partner who is seating in a leg dangling seat in front of you rises up. The first one to the top wins and gets a few victory bounces before coming down. It is an original and innovative ride that fit on a small trailer and one proposed concept is to use it at the entrance of a major ride. Whoever would win would get a front of the line pass. Strike-U-Up seats with a manually locking lap bar and seat belt. The stand with the Spin-U-Win in the foreground and Strike-U-Up in the background. A popular Japanese sensation made its North American debut at the Expo as well. 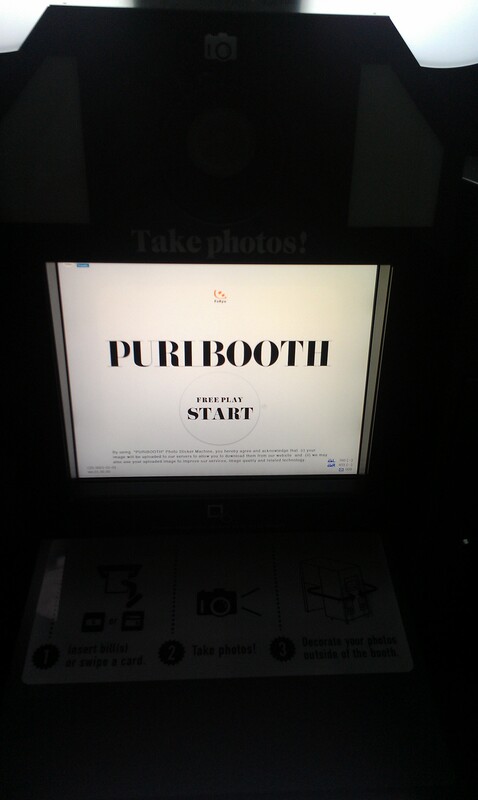 Furyu Corporation currently holds 2/3 of the Photo Booth market in Japan and they created a version adapted for America. 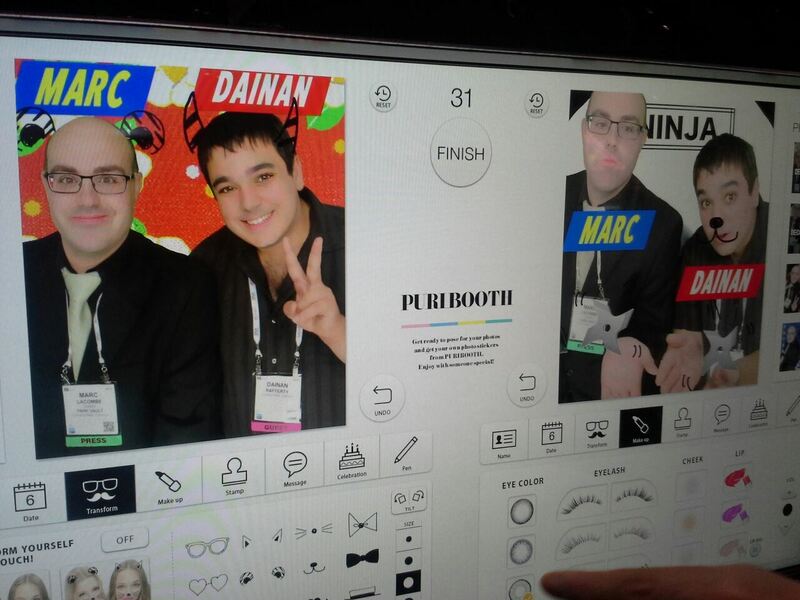 The Puribooth features professional grade strobe lighting, a Canon SLR camera and amazing software to improve participant features. The setting for the machines at the Expo recognised facial features and gave shiny hair and smooth creamy skins before you even had fun editing the pictures. 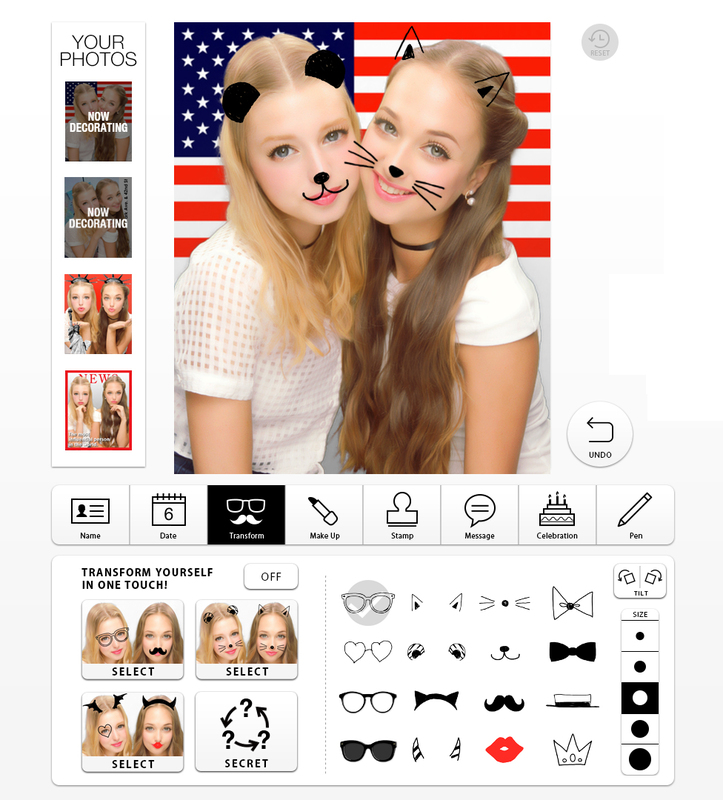 After taking 4 pictures in different poses and picking a themed set of backgrounds, you go out to a touch screen. You then get 2-3 minutes to edit all four pictures, adding silly things, changing eye colors among other things. 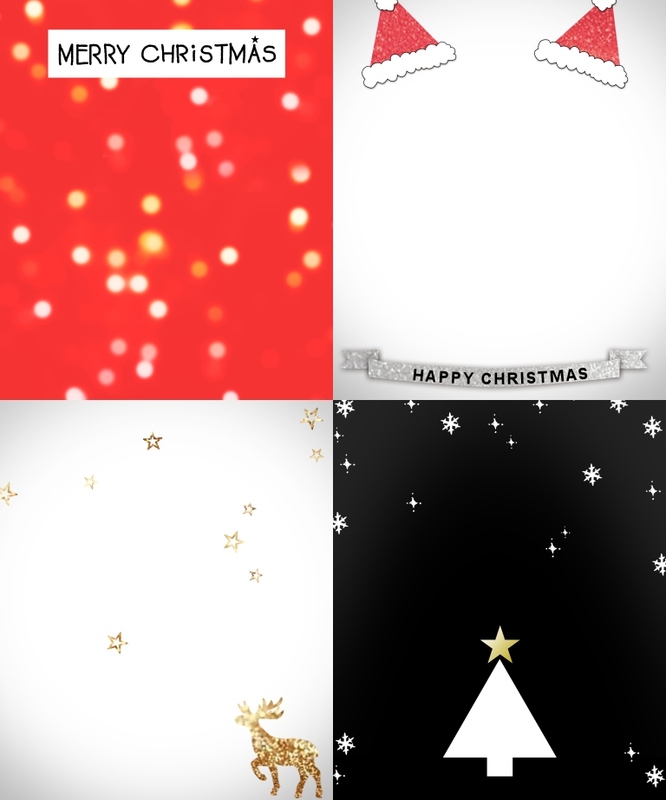 You then get a print in addition to getting a digital version on your Smartphone. Example of tag that can added to the pictures. The editing screen. Note that is it outside the machine, so another group can take their pictures while someone is editing, so you can effectively double your revenues. 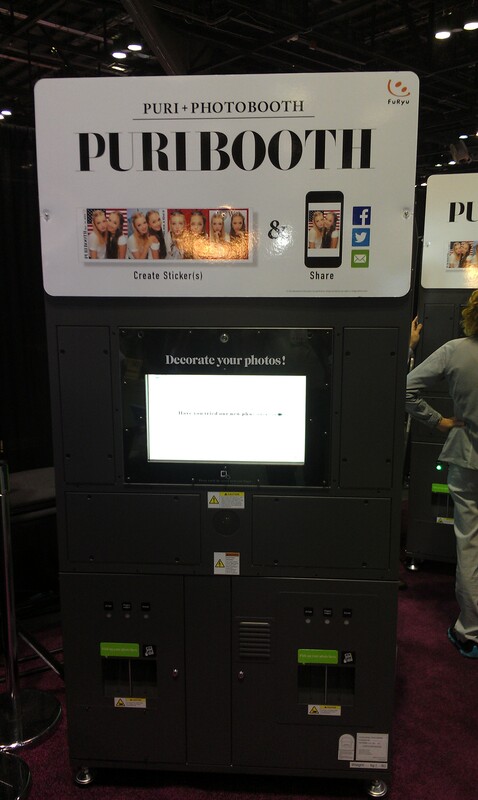 At the time of the Expo, at least one Dave & Busters location had purchased the Puribooth and interest at the show was very high. Vekoma had a very busy stand at the expo and this year, their partnership with Brogent Technologies of Taiwan was pushed forward. 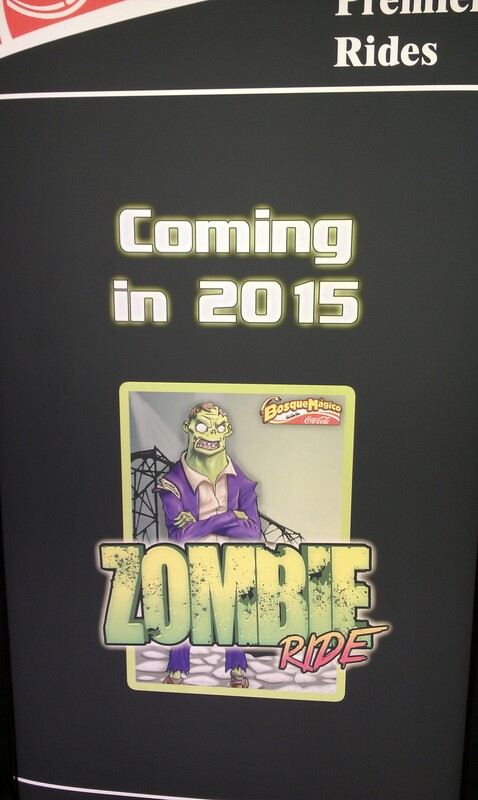 They also posted a teaser for a Single Car launched coaster. 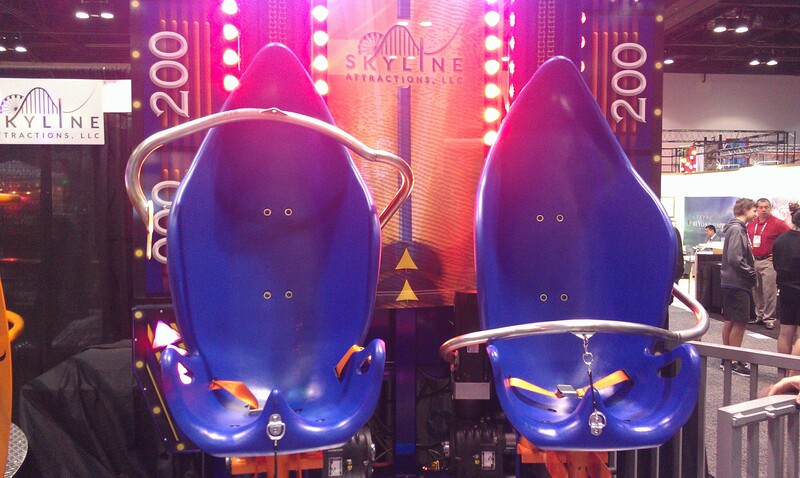 Brogent Technologies has taken the “Flying Theater” concept to the next level with the I Ride. Sold as the Panoramic Flight Theater by Vekoma, the latest version features a wing of 10 seats that have the full 6 DOF (Degrees of Freedom) in order to allow any possible movements called by the movie. Depending on budget and the park needs, you can have any number of wings on 3 levels. 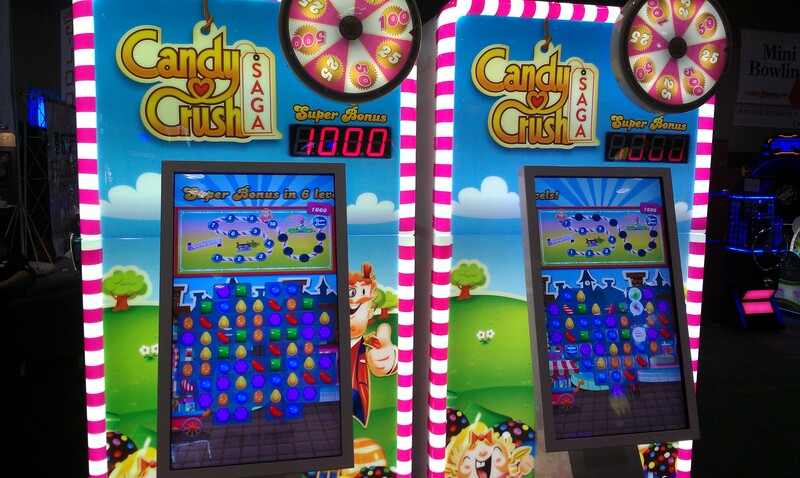 The large 67 feet high screen occupies riders full line of sight and various effects such as smells and misters can be integrated to the cars. The first i-Ride was a small 45 seats installation at the EDA Theme Park in Kaohsiung, Taiwan. Those cars have six DOF, 5 seats and are suspended. The park opened in 2010 and provided their own movie, which depicts beautiful scenery from around Formosa Island, which is today known as the Republic of China or Taiwan. The next major installation was Flyover Canada in Vancouver, BC. It is a standalone attraction that replaced the IMAX Theater at Canada Place and it has a 9 wings/61 seats arrangement. The 8 minutes movie is the longest for a flying theater and it has been getting rave reviews since opening. 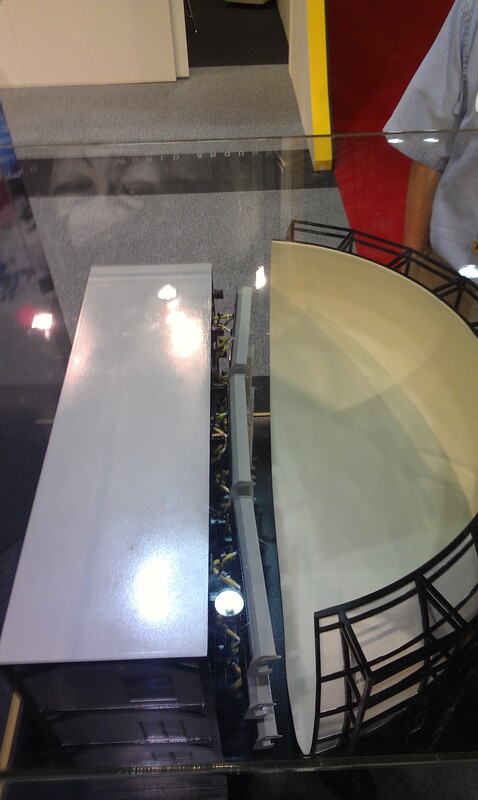 Model of a typical i-Ride installation. 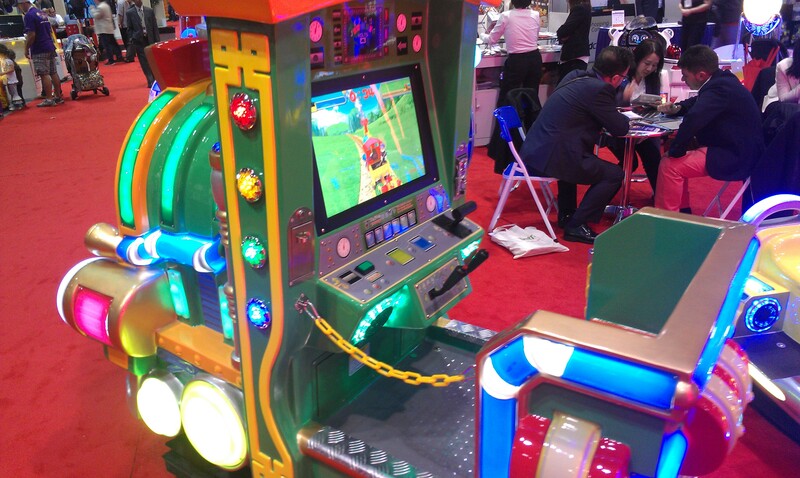 One further installation came in 2014, when an I Ride opened in Japan. 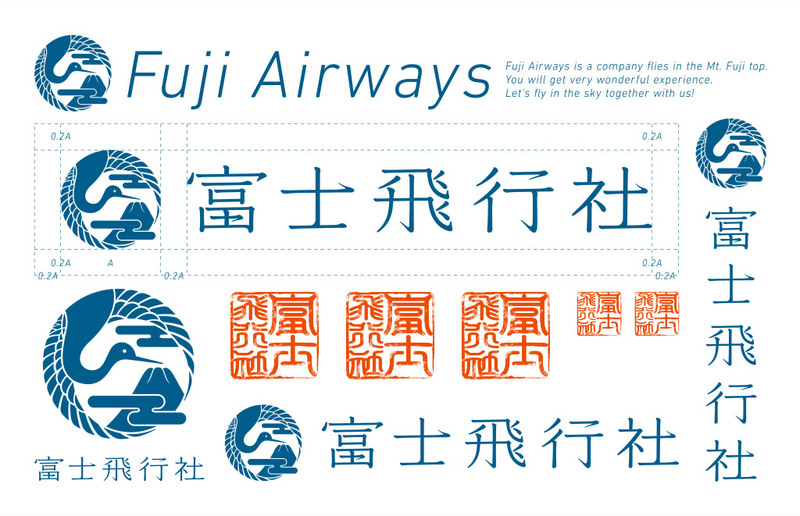 It replaced the large Gundam robot building at Fuji-Q Highlands and the name says it all: Fuji Airways. A crazy storyline provides the background for a beautiful flight around Mount Fuji. The fictional airplane used by Fuji Airways. 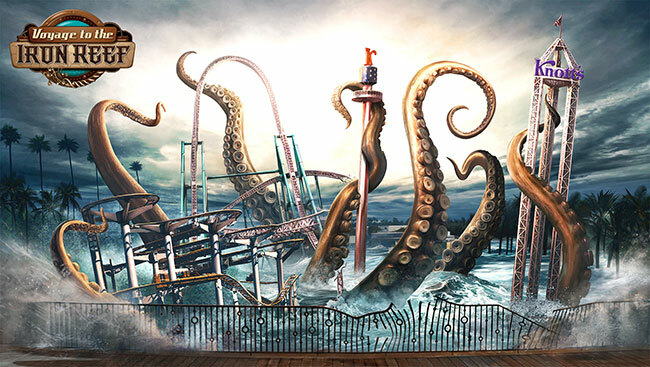 More attractions from Vekoma/Brogent are planned to open in early 2015 at the new Yumble theme park in Roermond, Netherlands and Miaoli, Taiwan. Safe Strap Company got their start in the amusement industry when their founder realized that all kiddie rides only had a rope to restraint children. He invented in 1983 the now familiar plastic buckle that is seen on every shopping carts and most kiddie rides today. They now import belt buckles from all around the world and manufacture their own seatbelt webbing which are then stitched together to the customer specifications, during the Expo, they introduced a new remote locking seatbelt mechanism. This is similar to the system that was invented for Walt Disney Imagineering for Star Tours in 1987. 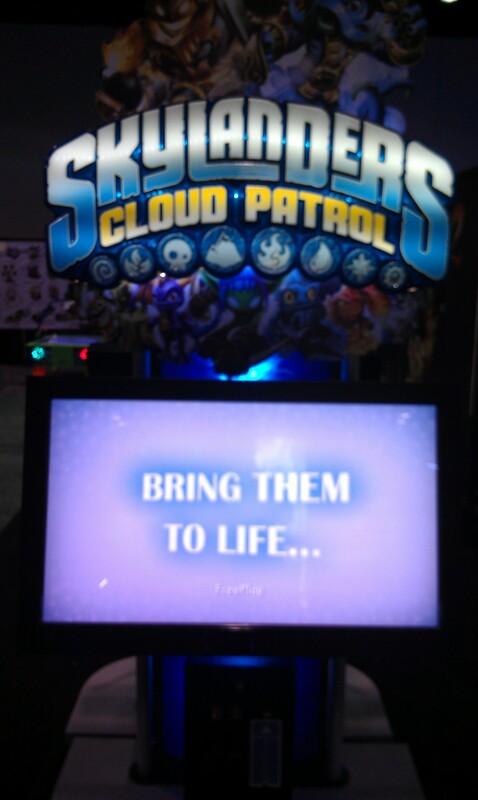 The same system is now in used at Disney parks on everything from Soarin’ to the Indiana Jones Adventure attractions. The major change is that starting this year, they can now sell that system to any customers around the world. The idea is simple: once your seatbelt is buckled, from the ride operator control panel, he can lock both the release button and extender, thus keeping the riders optimally restrained. 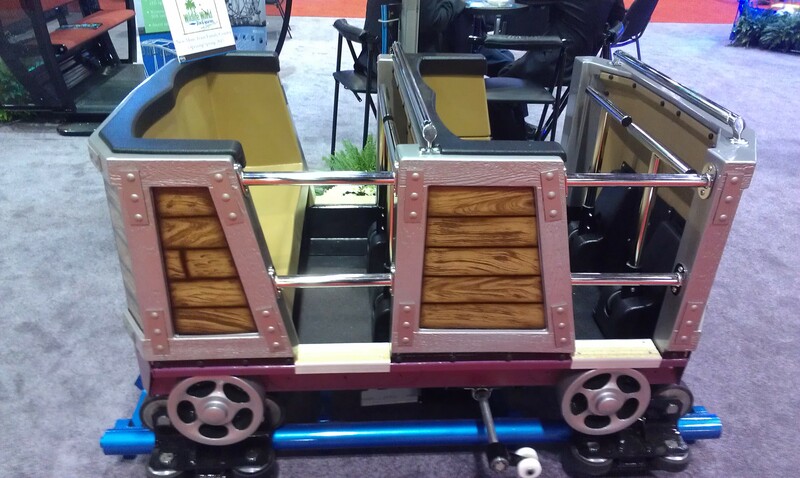 The test seat was a motion simulator seat, but it can be installed on anything from a dark ride vehicle to a roller coaster car. Premier Rides had their usual booth, with the posters now promoting Zombie Ride, a launched roller coaster opening in 2015 at Bosque Magico Coca Cola in Guadalupe, Mexico. This is the first magnetically launched roller coaster in Latin America and will feature a layout similar to Superman: Ultimate Flight/Sky Scream, but with a double loading station that will improve capacity. Thus, two trains will be able to run on the attraction. 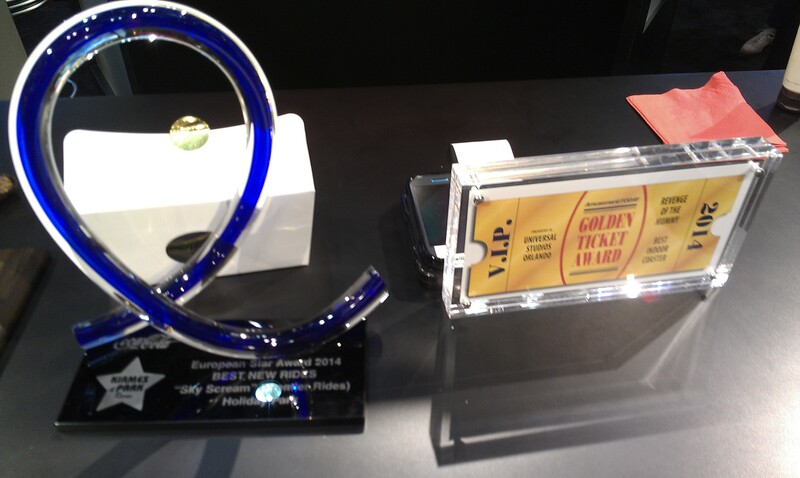 European Star Awards given by Kirmes & Park in 2014 for Sky Scream and the latest Amusement Today Golden Ticket for best Indoor Coaster, awarded to the Revenge of the Mummy floridian tomb. Chance Rides was proud to announce at the show that they had sold a family roller coaster to the Wildlife Zoo & Park in Litchfield Park AZ. One of the ride’s car was on display. Various games were also on display this year, with Adrenaline Amusement and Mecpower having some innovative rides in addition to the usual big names. Adrenaline Amusement is a Canadian company that is emerging as one of the best new player in the Ticket Redemption field. Their games are designed outside of Montreal, QC and also built in the area. 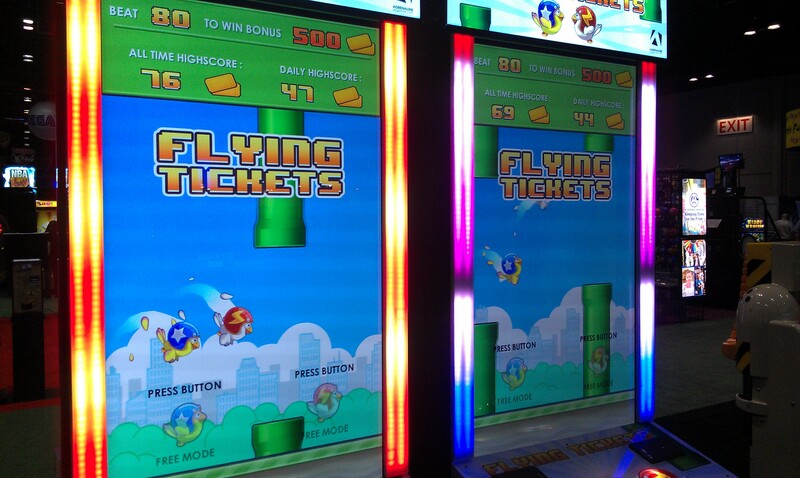 The concept here is based off Flappy Birds and you need to fly your bird the furthest in order to win tickets. It is competitive as well. 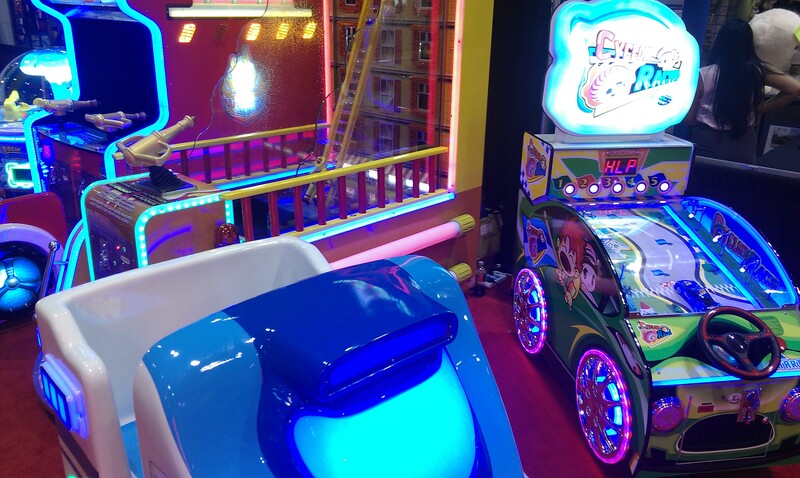 Tecway Mecpower is a taiwanese company that produce family rides, bumper cars and what was showcased this year at the Expo: coin operated kid experiences. 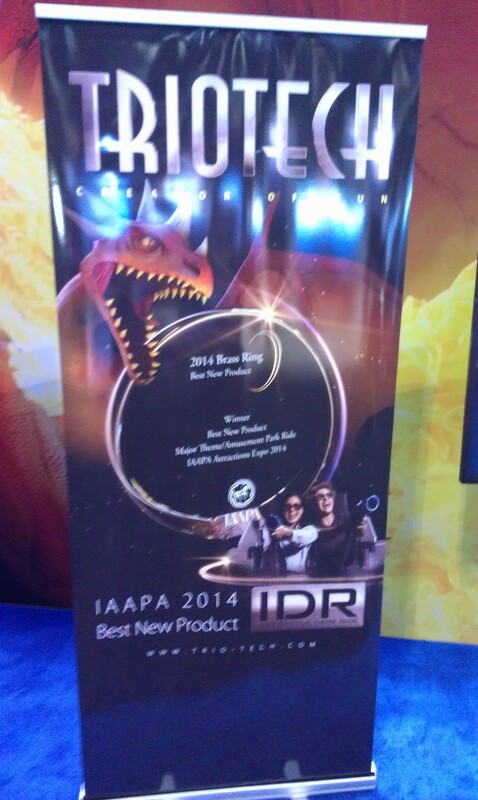 This conclude our IAAPA recap and we hope that you enjoyed it. See you next year for another incredible Expo! 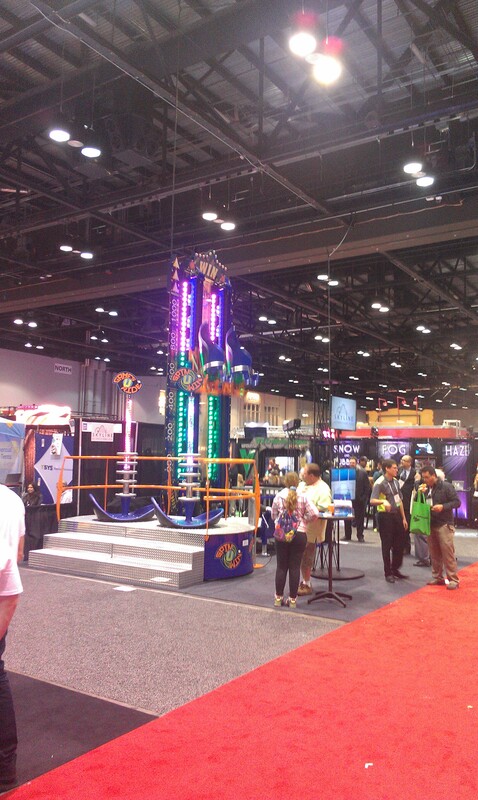 This entry was posted in IAAPA and tagged Adrenaline Amusement, Brogent, Cedar Fair, Chance rides, Dark Ride, Flyover Canada, Fuji Airways, Fuji Q Highland, Furyu, Knotts, Mecpower, Premier Rides, Puribooth, roller coaster, Seat Belt, Skyline Attractions, Tecway, Ticket Redemption, Triotech, Vekoma, wildlife zoo, Yumble, Zombie Ride. Bookmark the permalink.